The structure of Taj Mahal adheres to the Islamic style (Mughal style) of architecture, which flourished in India during the medieval period. The Islamic style of architecture is also referred to as the Indo-Islamic style of architecture. Overlooking the River Yamuna, and visible from the fort in the west, the Taj Mahal stands at the northern end of vast gardens enclosed by walls. Though its layout follows a distinctly Islamic theme, representing Paradise. 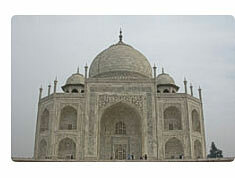 The Taj Mahal is set on a raised platform that is 6.6 meters (20 ft) high and covers an area of 93.9 sq. meters (313 sq ft). The corner minarets are 41.1 meters (137 ft) high. The main structure is 62 meters (186 ft) on each side. 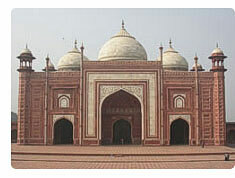 In contast to the gleaming white marble of the mausoleum, there is a pair of red sandstone buildings flanking the tomb to the west and to the east; the western building is a mosque, while the other, sometimes called the guest house or museum, was built to complete the symmetry of the scene. The water causeway and fountains beautifully join the gateway and the tomb in perfect symmetry. Befitting the most beautiful symbol of love, the Taj, is the gateway to this great monument. Taj Mahal looks like a miniature on the landscape from a distance, but appears to grow as you start to approach it. But, the minute you would enter the open square before the main entrance, you will be surprised to find the Taj Mahal disappear from your sight. Actually, the Taj is hidden by a massive red sandstone gateway within this square. 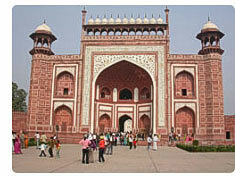 The massive Taj Gateway was completed in the year 1648 and stands 30 m high. The gateway is topped by small cupolas or chhatris. From a distance the Taj Mahal looks like a miniature on the landscape, which appears to grow as you approach it. However, as you enter the open square before the main entrance to the Taj Mahal, you will be surprised to find the Taj disappear from your sight. From within this square the Taj is hidden by a massive red sandstone gateway. Symbolic of the divide between the material and the spiritual, the gateway is decorated in calligraphy with verses from holy Koran. The original door of the gateway was made out of the solid silver and there are letters inscribed on it from top to bottom. All the letters appear to be of same size to the naked eyes. Actually, the engravers enlarged and stretched the lettering as their distance from the ground increased, creating an illusion of uniformity to the naked eyes. The actual function of this magnificent gateway was to prevent people from getting any glimpse of the tomb inside until they are right in the doorway itself. The tomb is visible from here only and the view stuns the eyes as one walks forward. The dwarfing images of people moving around the tomb 70 m high are excellent and the best that you can get. The large gateway opens into the courtyard. This courtyard was a place where the poor were provided with food and clothes. On every death anniversary of Mumtaz Mahal, huge amount of money was distributed in charity. On either side of the Tah Mahal are buildings of red sandstone. The one to the west is a Mosque. 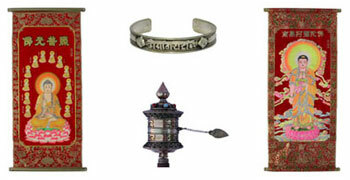 It faces towards Mecca and is used for prayer. Before we have a look at the Tahj Mahal mosque, let us take note of a small stone enclosure along the western boundary wall where the well of the Mosque is located. This greenery shaded structure, measuring 19 ft. by 6.5 ft. marks the site where the remains of Mumtaz Mahal were deposited when first brought to Agra. From this temporary grave they were removed to their present place of internment in the Taj Majal. On the outside the Mosque has pietra dura work twining across its spandrels. The platform in front of the Mosque is of red sandstone. A highly polished small marble piece is so fitted that it serves as a mirror and one can see the mausoleum reflected in it. The floor is of a material which is exceedingly fine and sparkling and appears velvet red in shade. On that 539 prayer carpets have been neatly marked out with black marble. All over there is exquisite calligraphy and the name Allah and quotations from scriptures inscribed. The roof supports 4 octagonal towers and 3 elegant domes. On either side of the Mosque, to the north and south, and set along and upon the enclosure wall, there are two towers. The garden in Islamic Style of architecture is not just another feature it has a well-defined meaning and it symbolizes the spirituality. According to the holy Koran, a garden is symbolic of paradise. Islam being a religion that was founded in the region of Arabia always gave value to the vision of a lush green, well laid out, and watered garden and in due course came to symbolize Islam. In Islam, it is believed that there are four rivers in paradise, one of water, other of milk, the third of wine, and fourth of honey. 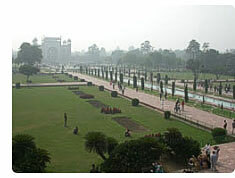 From this concept the char bagh style of garden planning took root. On leaving the entrance gateway, you can view a sprawling garden in front of you going all the way up to the plinth of the Taj. The Taj Garden covers most part of the Taj Complex. Out of a total area of 580 m by 300 m, the Taj Garden alone covers 300 m by 300 m. The guiding principle in creating this garden is one of the symmetry and it can be experienced everywhere. Though the garden is now maintained regularly, it is still a patch on the original royal garden. The char bagh, separated by the watercourses originating from the central, raised pool, were divided into 16 flowerbeds, making a total of 64. There were 400 plants in each bed. All the trees, either cypress (signifying death) and fruit trees (signifying life) were planted to maintain symmetry. The channels were stocked with colorful fish and the gardens with beautiful birds. Royal guests were invited to the tomb - so the stables and guesthouses were also built. The garden today is only peaceful region in the entire complex and the best for framing photos of the tomb with foliage. After crossing the splashing garden we enter into the tomb, which is placed on a high plinth (platform). The plinth is 6.7 m (21.98 ft) high and covers an area of 95 sq m (1,022.57 square feet). A double staircase facing the entrance to the tomb is the only way, which takes you on top of it. This is the perfect place from where you can get the eye-catching view of the Garden and the Yamuna. There are four elegant tapering minarets, one on each corner of the plinth. Each of the minarets is 41.6 m (136.48 ft) high and is capped by a small cupola. The minarets, not only balance the main structure of the mausoleum, but are also placed in such a way that in case of a mishap, they do not fall over the main edifice. Each pillar has a letter written on it, which put together spell the word ar-rahaman (all merciful) - one of the many names of Allah. From inside the mausoleum consist of a lofty central chamber, below this there are four octagonal corner rooms which were supposed to house the Graves of other family members, But Aurangzeb, son of Shah jahan failed to honor this wish. During the Mughal era it was a tradition to have two tombs, one is the public tomb surrounded by a silver screen with the jewels encrusted into it, while the actual ones are being in replica. Later, Aurangzeb removed the original screen and replaced it with an octagonal screen of marble and inlaid precious stones. The screen cost him Rs 50, 000 at that time, but the result is a stupendous piece of workmanship. Each screen or jali has been carved out of a single block of marble and all these blocks have been inlaid. By focusing on these carvings you can make out how intricate and minutely they have worked. Tomb above the main grave of Taj Mahal is part of the architectural beauty of this great building. In the words of Ustad Ahmad Lahori, chief architect of the project: " And above this inner dome, which is radiant like the heart of angels, has been raised another heaven-touching, a guava-shaped dome�crowning this dome of heavenly rank, the circumference of whose outer girth is 110 yards high flittering like the sun with its summit rising to a total height of 107 yards above the (level of the) ground." The dome is crucial to Islamic architecture, cosmologically uniting heaven and earth. The square of the edifice represents the material universe; the dome symbolizes the vault of heaven. The octagon stands for the transitional phase. Above the finial is the region of transcendence. The whole domed structure is thus designed as a replica of the throne of God in Paradise where a gigantic white pearl dome stands supported by four corner pillars from which flow the rivers of grace. The Taj architects have prominently used the keel arch set within a rectangle, repeating the shape everywhere "the gateway, niches, windows, trellised doors, plinth, dome ornamentation and cusped arches of the cupolas. To complete the image of Paradise the tomb has been most lavishly ornamented with splendidly calligraphed verses from the Quran. The tomb was accessorized with beautiful furnishings and artifacts like rich Persian carpets, candlesticks and lamps. The tomb was provided with sumptuous fittings and furnishings, including rich Persian carpets, gold lamps and candlesticks. It is reliably reported and documented that two great silver doors to the entrance were looted and melted down by Suraj Mal in 1764, and Amir Husein Ali Khan carried off a sheet of pearls that covered the sarcophagus in 1720. The Pietra Dura of Taj Mahal explores the magnificence of the Mughal art. Pietra Dura is a kind of carving into the stone. It is a skillful art that requires the hard labor. The tombs are decorated with exquisite pietra dura (stone inlay) work. Apart from unexcelled inlay work the tomb of Mumtaz Mahal is inscribed by 99 different names of Allah. It is said that the royal graves once laid inside a gem encrusted gold railing, which was later removed and replaced by an octagonal, all marble lattice (jali-perforated screen) screen of the most exquisite craftsmanship. Delicate inlay work can be seen on the surface of the screen. The floral decorations on the screen are amazing. Some flowers created on the screen are made up of as many as 64 pieces. The different sections of the screen are carved out of a single piece of marble. Various sections of the screen are joined together with gilded fasteners and the entrance is fashioned out of jasper, in the Turkish style. 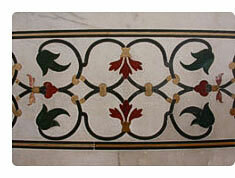 The crypt and the cenotaphs at the Taj carry the excellence of the pietra Dura. As Percy Brown, the noted art historian observes, the Taj "resembles the spirited sweep of a brush rather than the slow laborious cutting of a chisel". As many as 35 different types of precious stones have been used on a single bloom-turquoise, jade, agate, coral, lapis Lazuli, onyx, bloodstone, cornelian, jasper, garnet and malachite used to fashion blooms of fuchsias, lily, honeysuckle, etc. The ninety-nine names of Allah have been used to decorate the eastern and western sides of Mumtaz's grave in the crypts. Today, much is left to the imagination of the visitors as most of the precious stones have been plundered or destroyed.